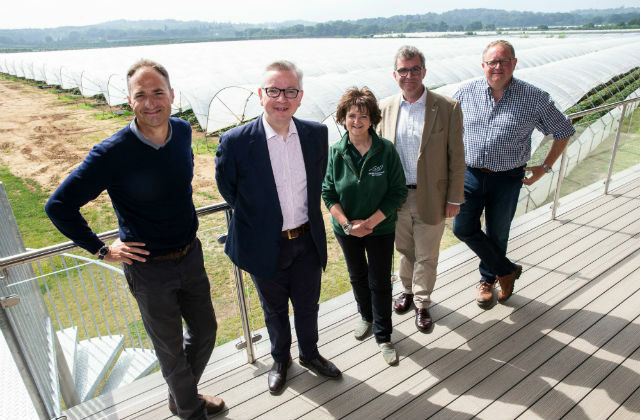 To mark Open Farm Sunday (10th June), the Secretary of State Michael Gove visited Tuesley farm in Surrey, one of the biggest fruit farms in the county, to see the brilliant work being done to connect the public with local farms. Open Farm Sunday is the UK farming industry’s open day, when more than 300 farms opened their gates for the public to learn more about the essential work that they do. During his visit, which was covered by FarmingUK, the Secretary of State toured the fruit farm fields and learned about the various crops that the farm grows, including strawberries and blueberries. He also met with LEAF Chief Executive Caroline Drummond and world-renowned scientists, from the ‘Science on Farm’ initiative, who discussed the work they are doing to develop new technology for British farmers and growers. While he was there, he also gave interviews to BBC Radio Surrey and BBC South Today to reiterate the importance of our food and farming sectors. Open Farm Sunday is a wonderful initiative to get people out in the countryside and showcase British food and farming. We grow some of the world’s best produce and I look forward to joining many others at Tuesley farm to learn about and sample the fantastic fruit this family business is famed for. In advance of Clean Air Day on 21 June 2018, the organisers, Global Action Plan have publicised new research which shows only around a third of people are aware about air pollution in the home. The research is featured in this morning’s Daily Telegraph and Sky News. There a range of potential sources of air pollution in the home including burning wood and spraying deodorant or cleaning sprays. The Global Action Plan press material includes some top tips on how to reduce air pollution in the home, such as burning only the cleanest fuels, opening windows when cleaning and washing new clothes before using. This government is determined to tackle air pollution, which is why we have a £3.5bn plan to improve the air we breathe and reduce harmful emissions. Our ambitious Clean Air Strategy, which has been welcomed by the World Health Organization, sets out how we will tackle pollution from all sources, including harmful levels of indoor pollutants. We will work with consumer groups, health organisations and industry to identify ways to achieve improvements in indoor air quality, raising awareness of build-up in the home and the importance of effective ventilation. You can read more about our Clean Air Strategy here . The Sunday Times has reported on the tough new regulations that will mean breeders who produce puppies with deformities will be liable to prosecution. The legislation comes into effect in October. Beverley Cuddy, editor of Dogs Today magazine, Gudrun Ravetz, of the British Veterinary Association, welcomed the move. The new regulations are a significant step forward to crack down on unscrupulous breeders . . . and put a legal duty on breeders to prioritise the genetic health of puppies. 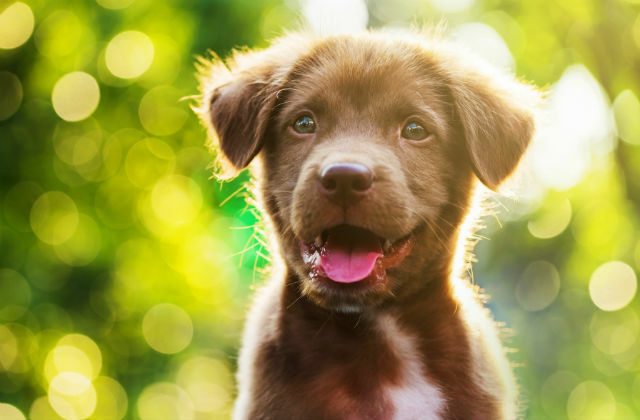 The article goes on to say some breeders are now calling for the Secretary of State to strengthen the law by banning pet shops and dealers from selling puppies. Defra recently ran a consultation on this issue and is currently considering all the responses. There was positive coverage in Sunday’s papers of our launch of a comprehensive review to beef up the government’s approach to serious and organised waste crime. The Sun, Telegraph, Independent and Express all covered the announcement. Waste criminals act illegally to evade landfill tax, undercut responsible waste disposal businesses, operate illegal waste sites, export waste illegally and fly-tip - blighting communities with bad smells, fly infestations and fires. Their activity cost the English economy more than £600 million in 2015 and the review announced by the Environment Secretary today is the next step in the government’s ongoing work to tackle the crime - which is already a serious offence with tough penalties. A Call for Evidence launched yesterday (10 June) will enable a wide group of people to have their say on ways to crack-down further on Organised Crime Groups (OCGs), who profit from waste crime. The review will be chaired by Lizzie Noel, a Non-Executive Director at Defra. Organised criminals running illegal waste dumps and fly-tipping are blighting local communities. They cost our economy vast amounts of money, pollute our environment and harm our wildlife. We must crack-down on these criminals who have no regard for the impact they have on peoples’ lives. The time is right for us to look at how we can best tackle these antisocial and inexcusable crimes. More than 850 new illegal waste sites were discovered by the Environment Agency in 2016-17. While an average of two illegal waste sites are shut down every day, they continue to create severe problems for local communities and business, particularly in rural areas, as well as posing a risk to key national infrastructure. Last year, we closed down two illegal wastes sites a day and were granted new powers to complement our existing enforcement efforts. Our officers are also out in communities, preventing and disrupting criminals through our intelligence led investigations, and also dealing with the consequences of illegally dumped waste to the environment and the wider community. We welcome the opportunity to review how best we deploy our resources and strengthen ties across government and with the police to target organised criminal rings behind illegal waste operations, and bring perpetrators to justice. Read the full press release and respond to the call for evidence on GOV.UK.